DEAD. I AM DEAD. IT'S THAT FANTASTIC. I thought The Unbecoming of Mara Dyer was going to be good based on the summary and what the general consensus was of my fellow bloggers. I had no clue that it would completely blow me away. From the get go, Mara packs an intense and emotional punch that grips you tight and doesn't let go, and even though you don't know what's going on, there's an eerie supernatural element that keeps you flipping the pages lightning quick to find out. Michelle Hodkin painted a creepy and suspenseful picture, but managed to balance it out with extrememly witty banter and dialogue, along with a smoldering romance that burns hotter and hotter as the pages turn. What I really loved was that Mara's entire family was like a very central part of the book. Too often in today's YA are the parents cast aside and the siblings portrayed so that the main character is living in their shadow. But Mara's older brother Daniel was sweet and protective of her, always looking out for her best interest, and her little brother Joseph was a cutie pie. And while I did think that Mara's mother needed a very strong dosage of some chill pills, she was only concerned for her daughter and acted the way she did out of love. Look at those abs... YUMMY! Entirely unique and unlike any other book I've read. It's a new flavor of paranormal for those that are getting tired of reading about vampires and werewolves. 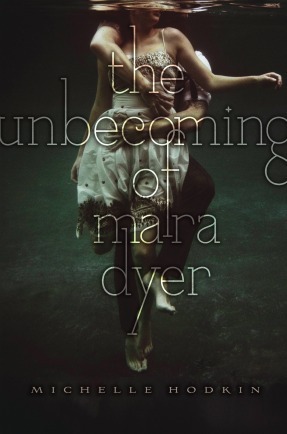 The Unbecoming of Mara Dyer is no doubt one of the best books, if not the best, that I've read in 2011. READ IT READ IT READ IT! Definitely 5 out of 5 stars. ADGSHJFHDJFHDFJDF. Look, you might be dead, but DON'T try drag me with you into the afterlife! What on earth do you think you're doing posting pictures like that?! *FAINTS* Noah Shaw, why have I not met you yet?! WHY?! Man, I am so freaking excited to read this. I have read not one - not a SINGLE - bad review for this. I'm so curious what the heck is going on and Noahnoahnoahnoah. Um, yeah. So, love your review! I really need to get a copy of this one! I've seen rave reviews, and I'm so anxious to read it. Thanks for the great review! This book sounds great. It's definitely on my wishlist. So glad you loved it! Unfortunately I think the hype did me in for this one and I just didn't love it. The first half? Absolutely. But the second half? Not so much. Still, it seems like most people really adore it, and it's always awesome to find a book you love so much.